I have a big post coming pretty soon on the User Profile Synchronization Service (UPSS) within SharePoint 2010. In my opinion this is going to be a real sore point for Administrators with SharePoint 2010, which is a shame as the redesign has a lot of potential in the way it works. Until then here is a small tidbit that I came across which is still User Profile Synchronization Service related. If you have this issue where when you create new audiences and they just will not compile, most likely this is being caused by the UPSS not being started. Whenever I clicked “Compile Audiences” I was met by no change what so ever, and no error message. I also noticed that no matter how many times I clicked compile the Last Compilation Time would not change at all. A hunch told me to go have a look at the User Profile Synchronization Service, which was for an unknown reason stopped. I restarted it (and crossed my fingers), then I went and grabbed a coffee, read War and Peace, and then 10 minutes later it was started and running normally. And finally a quick screenshot showing what it should look like when it works, and also where all the relevant links are. There will be a post coming fairly shortly detailing some of the difficulties I had with the User Profile Synchronization Service. Good Luck until then! After an extremely successful SharePoint conference earlier this year in Sydney run by the fantastic folks at SPEvents, it looks like there is going to be a South East Asia SharePoint Conference around October of this year! The conference is going to be in Singapore on the 26th and 27th of October this year at the Grand Copthorne Waterfront Hotel. The site is up and can be viewed at http://www.sharepointconference.asia/ and has details of the location, speakers, sponsors and more. I was able to present my session on one of everybody’s favourite topics – Content Deployment! 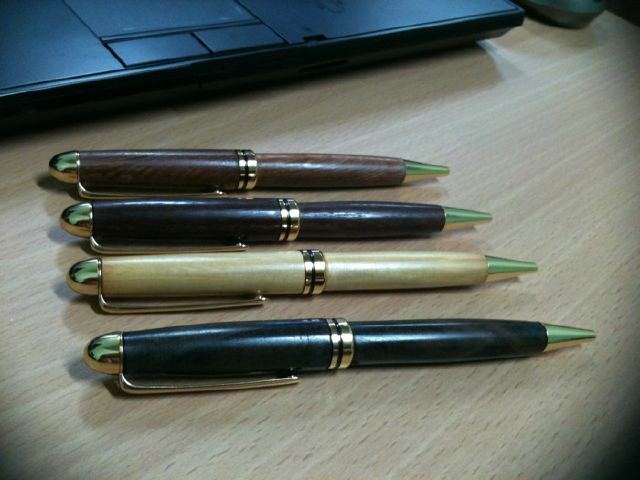 The session went quite well and I had a great amount of participation from the Audience, including giving away four hand made pens that I made myself, these seemed to be fairly well received and I like to think they were a unique touch. I was also really fortunate to participate in the “Ask the Experts” session with Elaine Van Bergen, Todd Bleeker, Arpan Shah and Paul Swider. This was a great way to finish off the conference as we were able to have a good time answering questions as well as giving a few laughs to the audience. I was also able to participate in an excellent podcast by Jeremy Thake which will be available fairly soon on http://www.sharepointdevwiki.com. The podcast was on the topic of “Sandbox Solutions” and was moderated by Jeremy and included myself, Arpan Shah, Todd Bleeker and Paul Swider. I will post the link as soon as it is published. 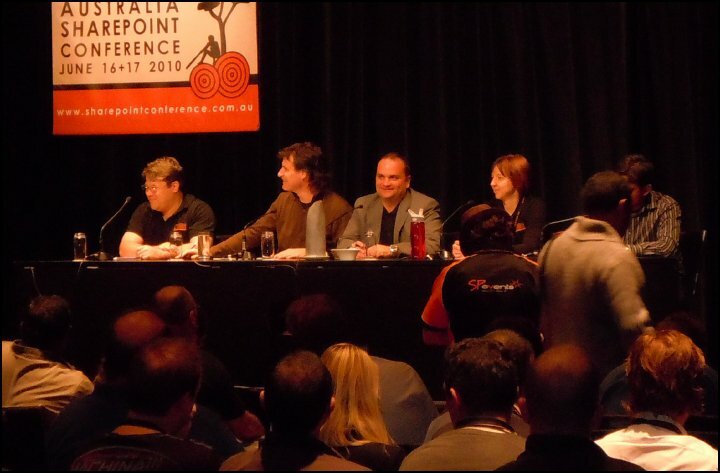 The conference itself was incredibly well organized and I think has set the bar in what to expect from these events within Australia. Huge thanks to Debbie Ireland, Mark Orange, James Milne, Kathy Hughes and Brendan Law, as well as the crew at http://spevents.co.nz/default.aspx for such a great time. Foreword : Huge thanks to Todd Klindt for sending me a sneak preview chapter of his and Shane Young’s new book. Their chapter on Service Applications helped me to work through and figure out why this process was not initially working for me as it is extremely finicky and will fail if the ordering of these items is incorrect. PowerShell, well mostly through PowerShell. So there are a few downsides with that, sure its easy and repeatable but to a lot of people it is not terribly friendly. There is also the fact that while it works, in situations where there are issues PowerShell will smile and let you continue blindly down the path while you might not realise that the end process is going to fail. So with all of that in mind, how do we publish Service Applications between SharePoint 2010 farms in Central Administration” Well not all of it can be done easily through Central Administration. The first few steps “exporting the certificates” still need to be done in PowerShell. This should get us to the point where all certificates have been exported and are ready to be imported on their respective servers. Click “New” on the ribbon. A new screen should pop up labelled “Establish Trust Relationship”. Put in the name. I generally use “PROVIDER [FARM NAME]” to denote a certificate imported from a PROVIDER farm, and vice versa for CONSUMER. Do not tick the box for “Provide Trust Relationship” or upload another cert as this is all you need on the consumer farm. Click “OK” and you should now have a new Consumer trust established. As per the previous steps open up Central Administration, and browse to “Security” then click on “Manage Trust”, then click “New” on the ribbon. Next click “Browse” and select the “Consumer-root.cer” file that was exported to c:certificates. You should now have a new trust appearing on your provider. Note : On a farm providing services, the trust will be labelled as “Trusted Service Provider” and on a farm consuming services, the trust will be labelled as “Trusted Service Consumer”. Please note that this denotes the trust itself, not the certificates or the farm, hence why the naming may seem confusing. At this point we really need to return to PowerShell to do steps 10 and 11 from the previous blog post. It is a bit annoying, but unfortunately I don’t know of any way to establish the permissions, or even retrieve the farm ID from Central Administration. 4. Check that the permissions have been established. 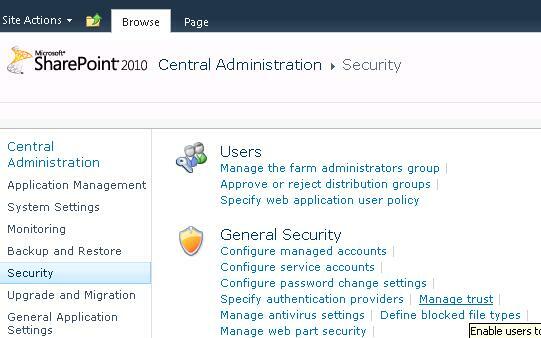 On the provider farm you can check to ensure the permissions have been granted successfully by loading up Central Administration and going to “Manage Service Applications”. Click on “Application Discovery and Load Balancer Service Application” and click “Permissions” from the ribbon. 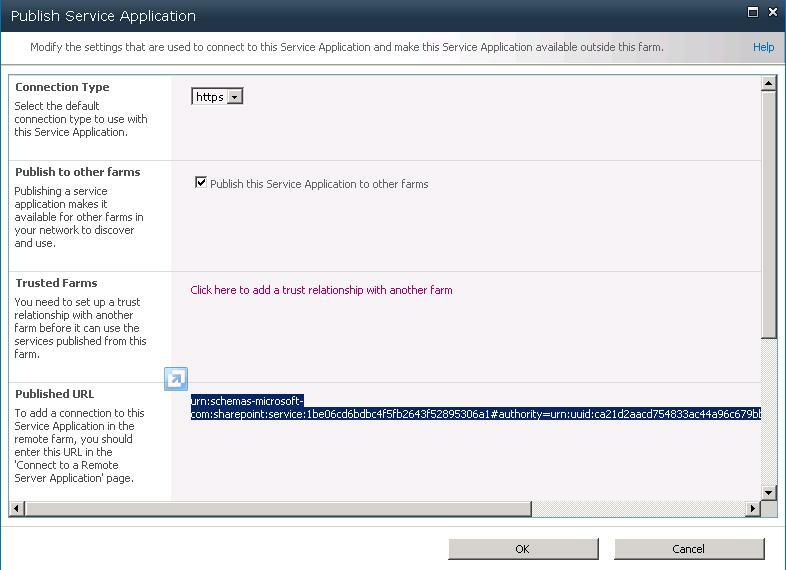 Then select the connection type, check the checkbox “Publish this service application to other farms” and be sure to copy out your Published URL to your clipboard. Click on “Connect” from the ribbon and select the appropriate Service Application Proxy Type. Now select your new service application and click “Properties” from the ribbon. If you can see this screen and edit the properties then you can be fairly confident the connection has worked successfully! I personally find that the easiest way to do this on a repeatable basis is via PowerShell, however in almost all situations I will use Step 7 from this post to connect as it is just easier, and if for some reason it fails then it will actually tell you. While none of these steps is especially difficult, putting them together in a cohesive order that works every time took a bit of juggling. I hope these posts have been helpful.